fitting a puzzle together . . . 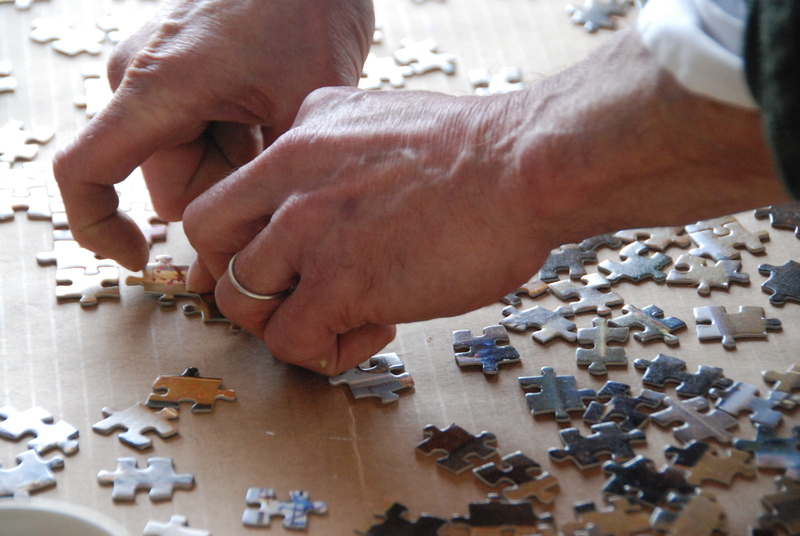 Putting jigsaw puzzles takes patience, an eye for shapes, colors and design. Some people are good at it and can spend hours poring over a myriad layout of tiny pieces, sorted by color, the edges already formed, at least if you are experienced at this kind of thing. I have patience to knit, a sometimes tedious-looking kind of activity, repetitive, requiring counting and the willingness to go back and pick up a dropped stitch, or one that stands out from the tension of the piece you are working on. My husband, G, could no longer knit than I could do jigsaw puzzles.